Charlotte shows off the haul... soon to be made into delicious jam. 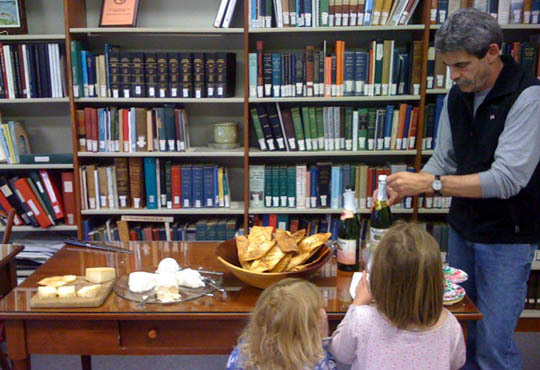 Tastings at the Gray Public Library have been a big success. Steve Arsenault serves the girls some cider -- better that than the delicious home roasted coffee that he shared with us grown-ups in June. 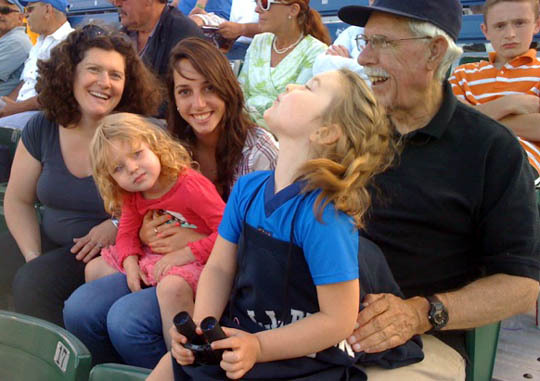 Margaret, our Israeli camp counselor Yuval, Grampa Steve, and the girls take in a Sea Dogs game. Charlotte rides the bus to her first day of camp. 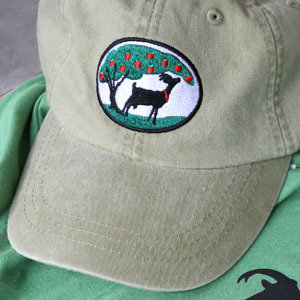 What's a summer campfire without marshmallows? You know the garden is in full production when pizzas on the grill are all-out garden affairs. Here we have roasted peppers and eggplant, sungold tomatoes, basil, garlic, and arugula in the back. ...with terrific and delicious (smoked duck) results. And what would summer be without fruit pie? This one was peach and cherry. Yum.